World`s Fastest, Most Reliable & Easy to Use VPN Service for PC! 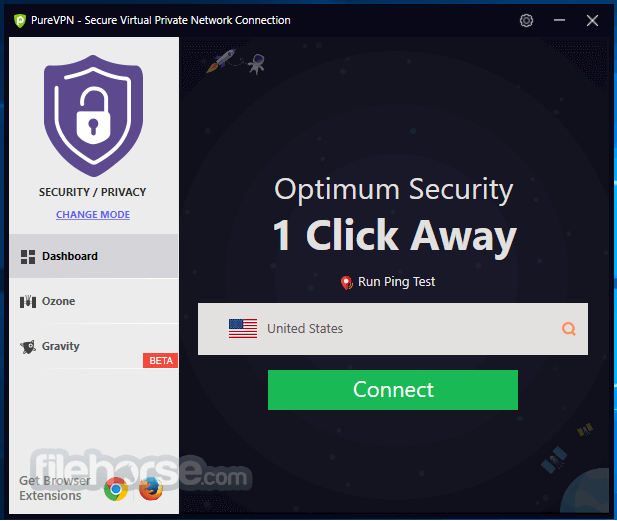 PureVPN is a VPN service provider that offers most secure and the fastest VPN service. It protects you online with its 256-bit encrypted secure VPN servers. PureVPN’s app for Windows provides you with security features to protect your identity, data, and online freedom. TheWindows app is not just fast and speedy but is also very easy to use. You are allowed to select the protocol of your choice or you can trust on Pure VPN’s selection as well. With servers in 141 countries, you are allowed to switch to any server you want. It protects your identity online by masking your online traffic. What this essentially means is that hackers and cybercriminals will no longer be a nuisance. 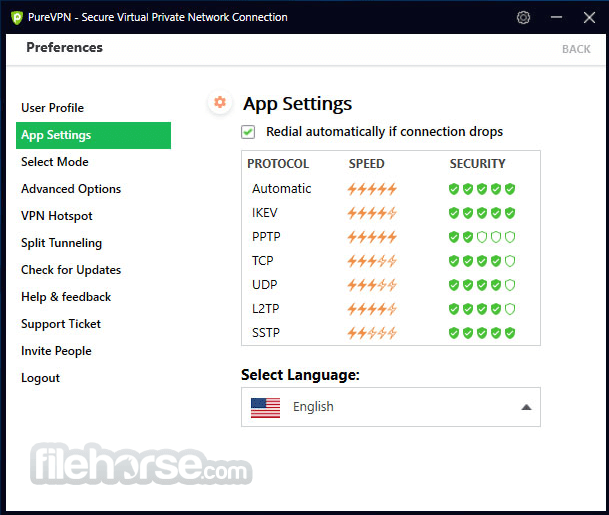 But that is not all as PureVPN Windows VPN app protects you on any and all networks, including public Wi-Fi hotspots as well. Any and all traffic being sent and received by a user is encrypted via Pure VPN for Windows. The encryption is state-of-the-art and is simply impossible to crack. Moreover, since Itoffers AES 256-bit encryption, which cannot be cracked by super computers either, thus solidifying its stance in regards to protecting any and all of its users along with their traffic. With the program, your internet traffic is masked at all times. Also, upon disconnection, the internet kill switch feature will prevent your IP from being revealed. This can prove to be of great use to those who tend to connect to public Wi-Fi hotspots, which are generally insecure. Once connected, users and their identities are masked, thus preventing one from getting unwanted attention. Taking into account the number of servers the VPN has to offer, users can connect to any one of them for complete internet freedom. Regardless of one's location users can connect to PureVPN's servers at any given time for unrestricted access to the internet, all the while being completely invisible to hackers and cybercriminals alike. The app stops threats well before they reach your device by recognizing malicious patterns and codes at server level. Smart algorithms are good at knowing the difference between content & ads, and even better at blocking those ads. Our intrusion detection and intrusion prevention system acts as a barbwire around all of your data and devices. Preloaded lists of blacklisted and whitelisted URLs to keep your browsing from ending up on rogue websites. Create and manage a list of apps that you don’t approve off block anyone on your network from using those apps. Nothing can be compared to the unmatched privacy and security that provides. Bypass all geo-restrictions and access all the content from around the world. Encrypt all your data and sending it through secure tunnels, making it impossible to trace. Get a customized experience and connectivity with every mode. Modes are designed to give you a better level of usability. The Ping test helps the user determine which server is the fastest and best suited for their needs. Share files with peers anywhere anytime with PureVPN’s file-sharing mode. Select the protocol of your choice or leave it to PureVPN’s app for quick connectivity. Choose your desired location from 141 countries with just a few clicks. Choose from dozens of purposes and get the best connection accordingly. Get a dedicated IP from a specific location in a matter of seconds. Note: You need a paid account to connect to a server.